The Governor of Arunachal Pradesh Brig. (Dr.) B.D. Mishra (Retd.) called on the Union Minister of Human Resource Development (HRD), Government of India Prakash Javadekar in New Delhi on Frida and discussed about the pressing need for strengthening the higher education system in the State of Arunachal Pradesh with the HRD Minister. The Governor, who is the ex-officio President, NERIST Society and ex-officio Chief Rector of the Rajiv Gandhi University, the lone Central University of the State, apprised the Union Minister regarding the challenges the Higher Education sector in the State is facing. Taking up the issues of North Eastern Regional Institute of Science and Technology, the Governor highlighted the falling number of students’ admission in NERIST. He informed the HRD Minister regarding the immediate need to post a high calibre director to NERIST. The HRD minister assured the Governor that the process of selection of a Director is complete and within a short time the Director’s name will be announced and he will be directed to join as soon as possible. The Governor also appraised the minister regarding the ongoing construction project in NERIST. The issue was discussed in detail including the priority for the completion of essential buildings. It was decided that the student study, lodging and boarding related buildings like classrooms and student hostel will be completed at the earliest. The Governor also took up the issues related to the National Institute of Technology, Arunachal Pradesh, which has a permanent site at Jote but is temporarily functioning in Yupia. Concerns were expressed regarding the horizontal commencement of the construction work at the NIT permanent site at Jote. After in-depth discussion, it was decided that audit and monitoring of the Central funds and grants utilisation should be done early for mid course correction if any. The Governor and HRD Minister had extensive discussion regarding the issue of mushrooming of private universities in Arunachal Pradesh. It was felt that students’ academic interest, good study atmosphere and appointment of faculty with excellent teaching calibre must be ensured in all institutions of higher education at all times. It was decided that the private university’s monitoring system as already stipulated by various statutory directions from the State Government should be put in the place at the earliest. 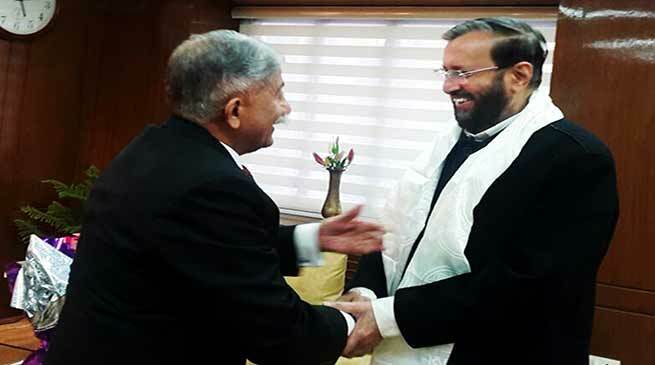 The Union Minister also expressed views that all universities and higher education bodies, both private and public owe it to the student community to deliver the best education, help in students’ personality development and promote research and innovation facilities for the benefit of the people and the development of the nation. The HRD minister appreciated the free and frank exchange of views on the issue of higher education in Arunachal Pradesh and assured all help to provide best academic facilities to the students of Arunachal Pradesh studying in any university or institute across the board.